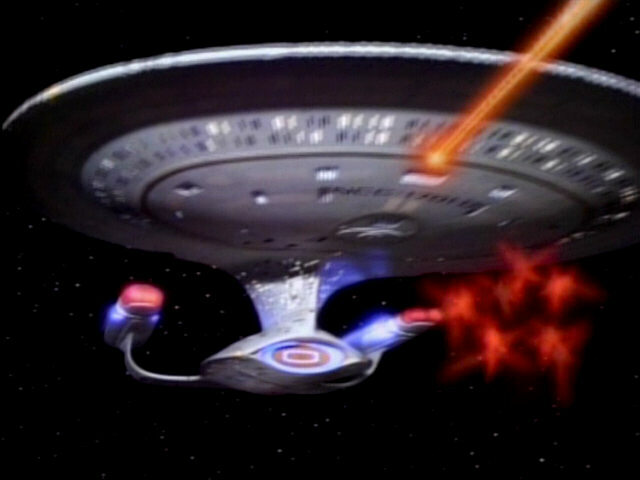 Ex Astris Scientia - Observations in TNG: "The Arsenal of Freedom"
Observations in TNG: "The Arsenal of Freedom"
Here are some observations about sets, props and visual effects in TNG: "The Arsenal of Freedom" without a specific theme, and a comparison of the original TV release (TNG) with the remastered episode (TNG-R). 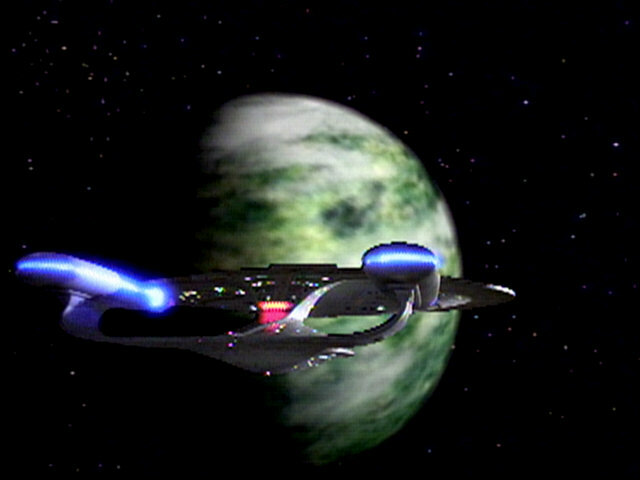 Minos was previously seen as Angel One in the eponymous episode. 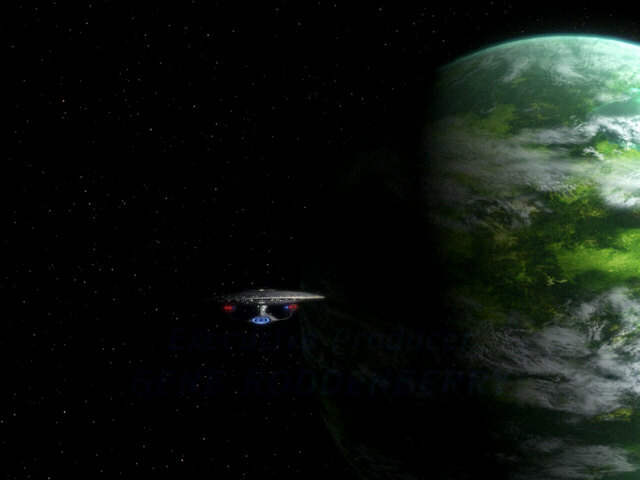 The planet will be seen twice more, as Theta 116 VII in "The Royale" and as Legara IV in "Sarek". 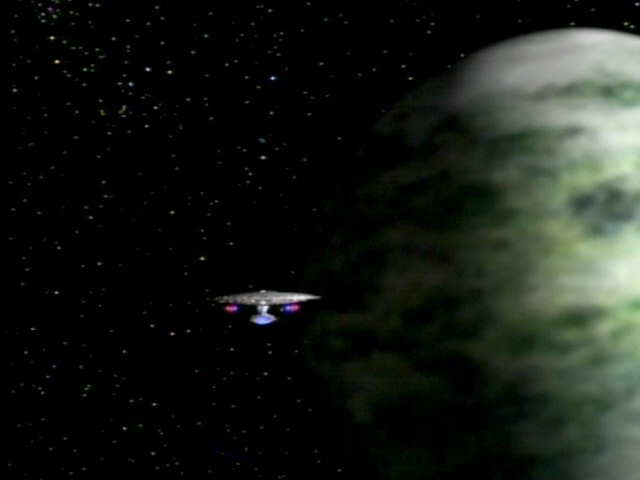 Re-Used Planets in TNG The planet was reconstructed for TNG-R by Max Gabl, who faithfully followed the lines of the original. 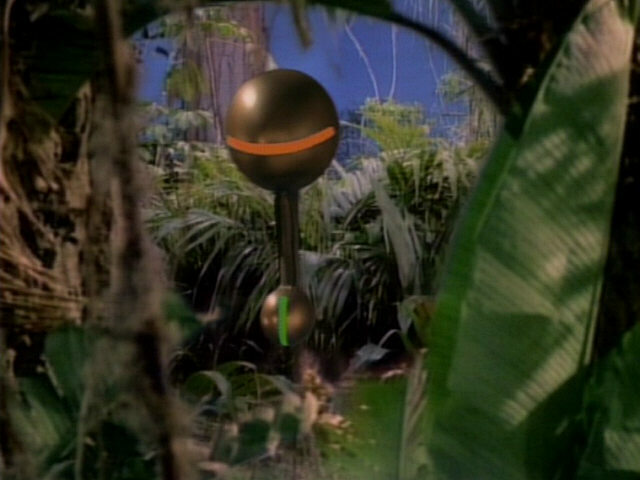 As in the original release, Minos may be the same model as Angel I, shown from different angles. 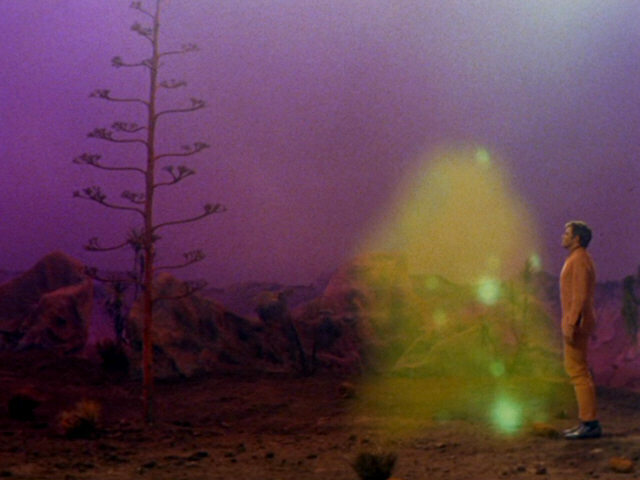 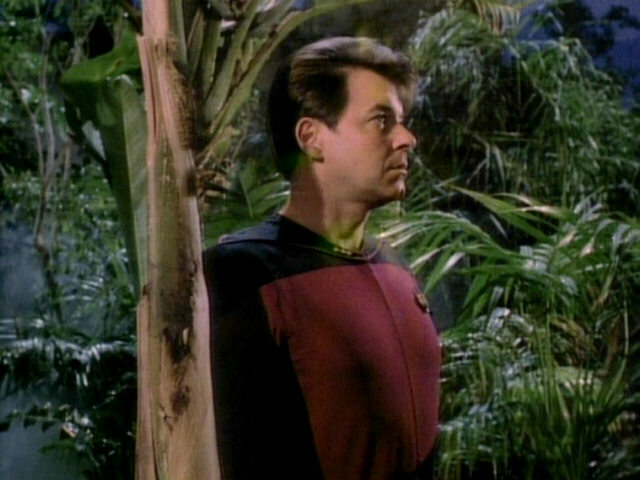 Some of the trees on Minos are very similar to trees seen on some TOS planet surfaces filmed in the studio, including the surfaces of Gothos in "The Squire of Gothos" and the Companion's homeworld in "Metamorphosis". 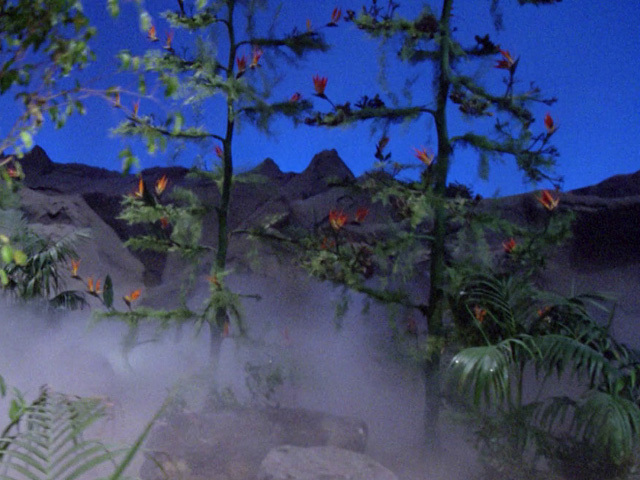 This "tree" is in fact the cut off flower stem of Agave americana. 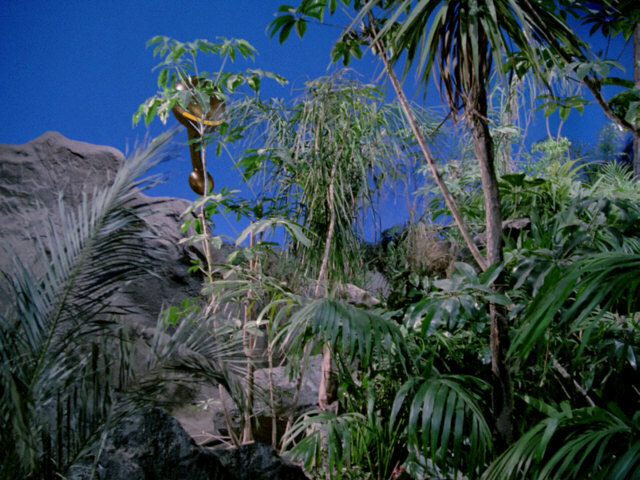 of Gothos" A better look at the trees in HD. 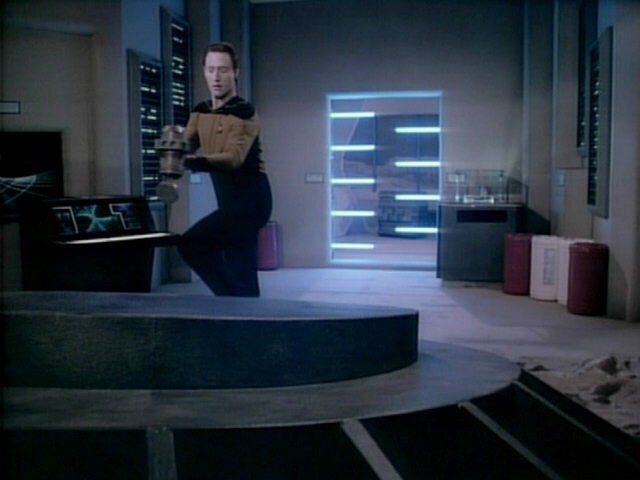 The round platform the Minosian cannon is resting on was previously seen in "Heart of Glory" as part of the Batris's warp core and will appear again in "We'll Always Have Paris" as the bottom part of Dr. Manheim's time experiment. 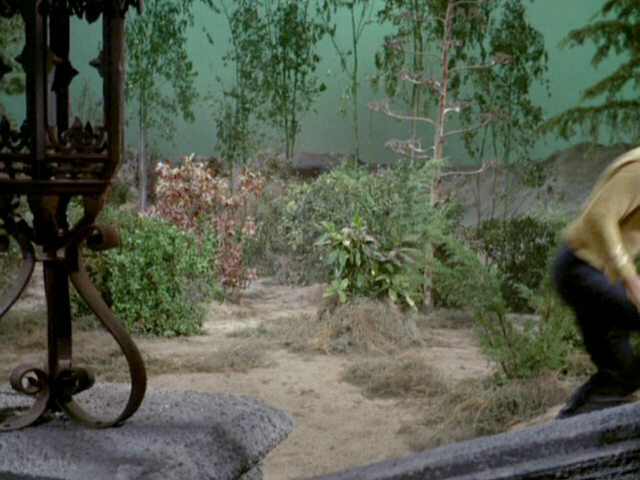 Have Paris" A close-up of the platform in HD. 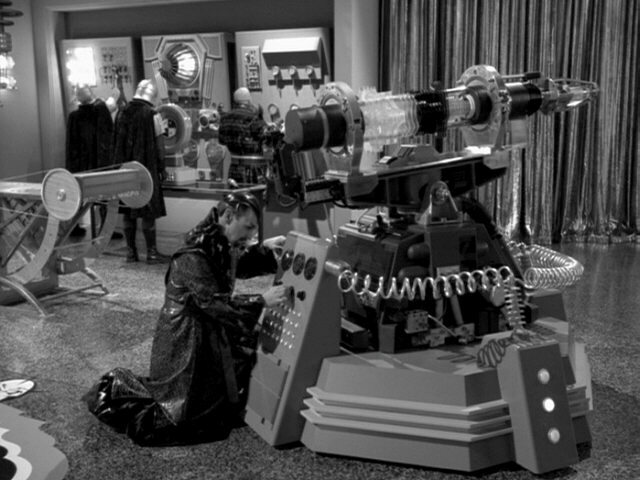 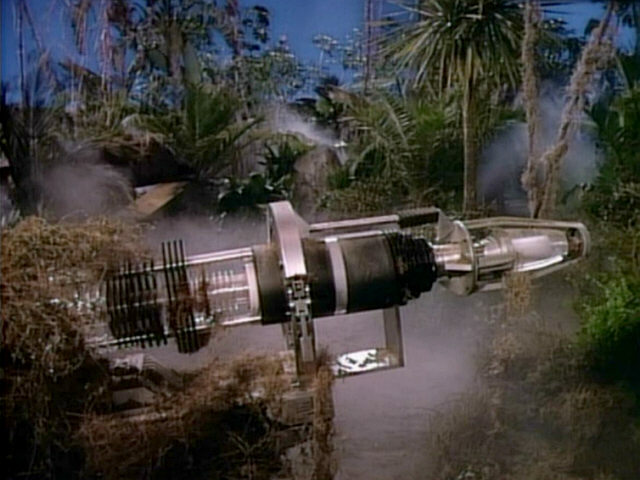 The Minosian cannon, which also appeared again in later Star Trek episodes such as VOY: "Bride of Chaotica! 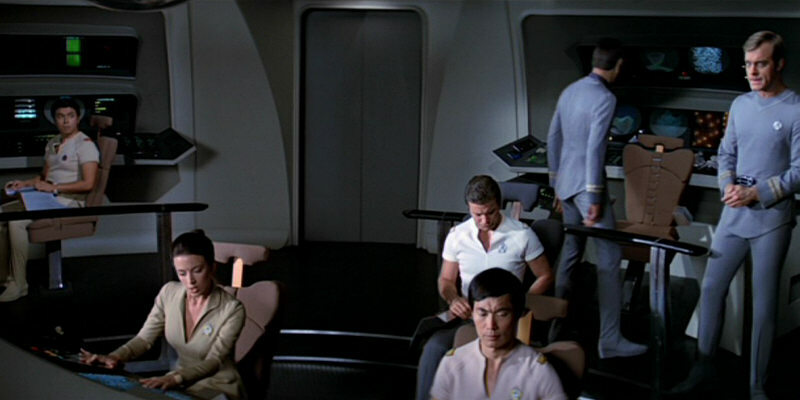 ", was rented from Modern Props. 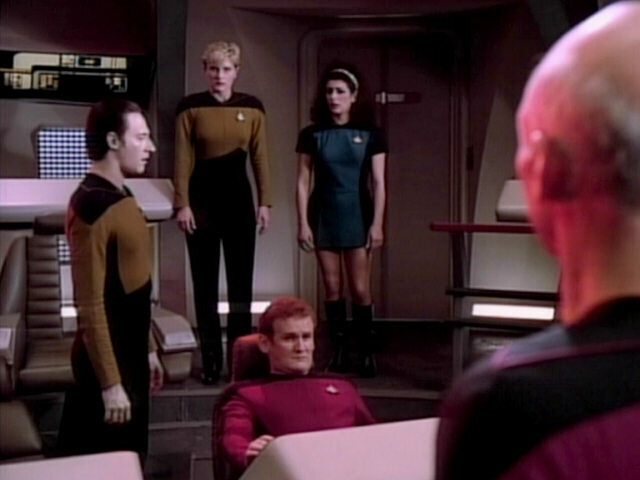 The shot of Riker on Minos, with Paul Rice in the background, was later re-used in "All Good Things" when Picard uses a desktop monitor to talk to Riker on Deneb IV in the scenes set during the pilot episode. 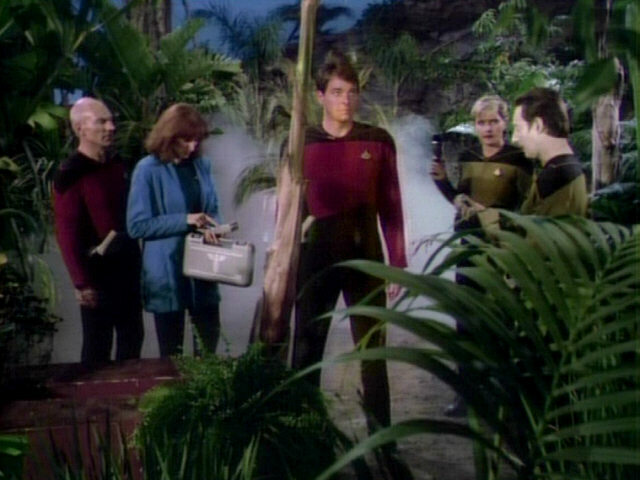 "All Good Things" The improved shot in TNG-R.
A flower pot is visible in this shot. 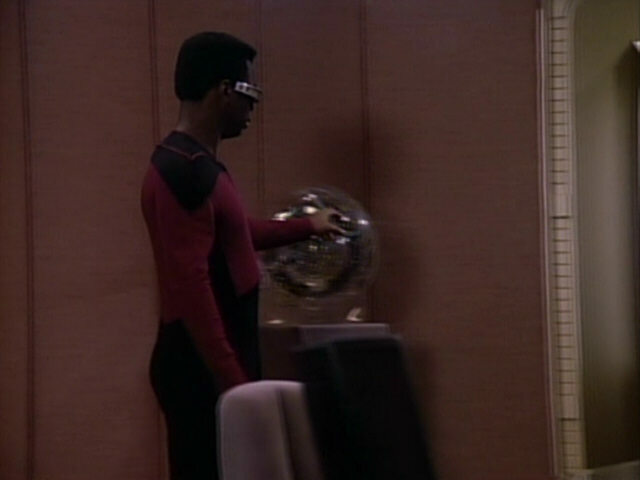 The flower pot is gone in TNG-R. 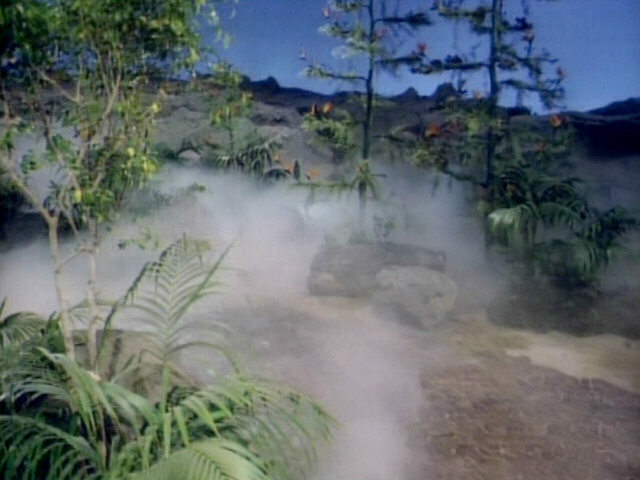 It was digitally covered by a piece of rock like the one to the left of the pot. 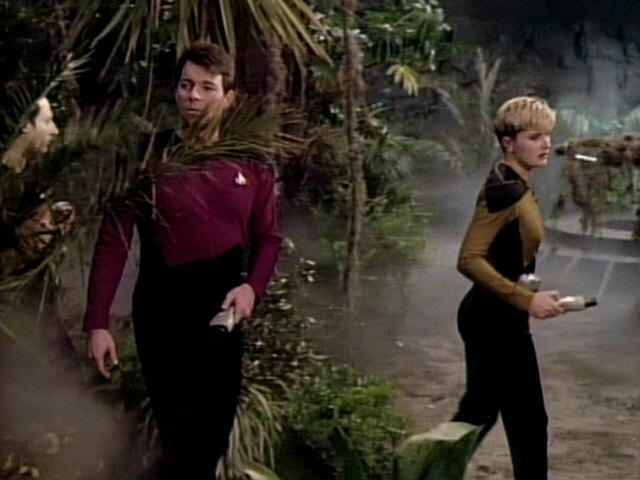 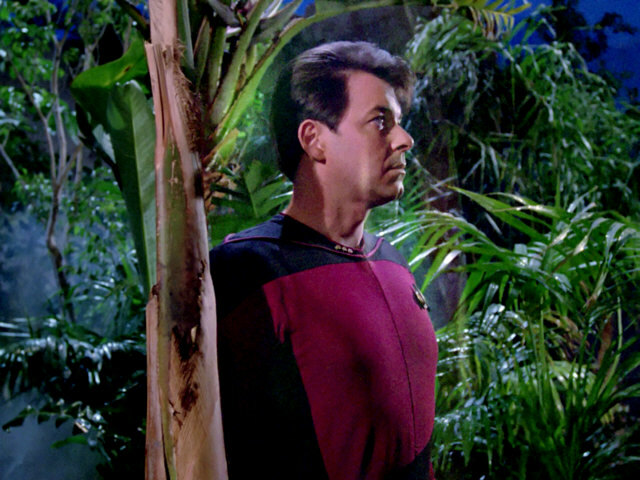 This shot is noteworthy because it seems that the left half of the image (everything to the left of the tree behind Riker) was edited in using split screen. 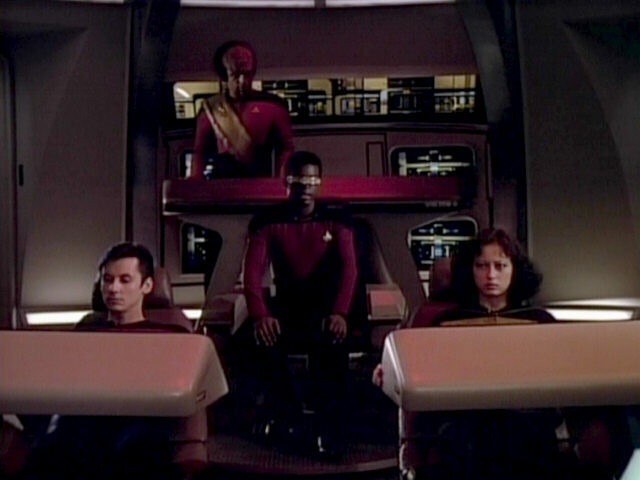 This is nearly not noticeable, only when comparing the first frame of the sequence with the last frame or my viewing the shot in faster than normal speed, it becomes obvious that the right half of the screen is perfectly stable while the left half moves slightly. 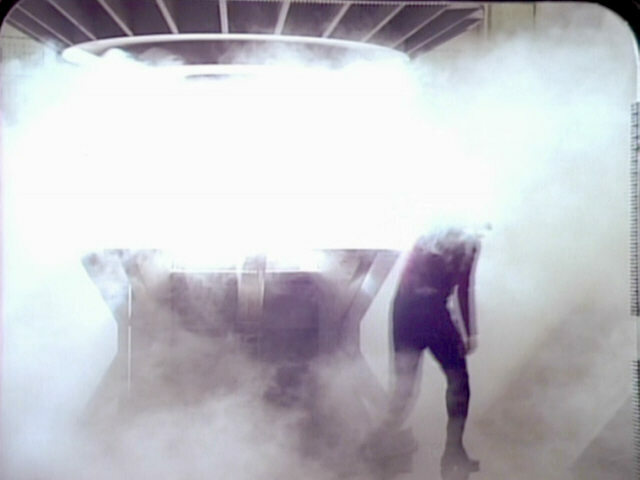 This shot too was fixed for TNG-R. 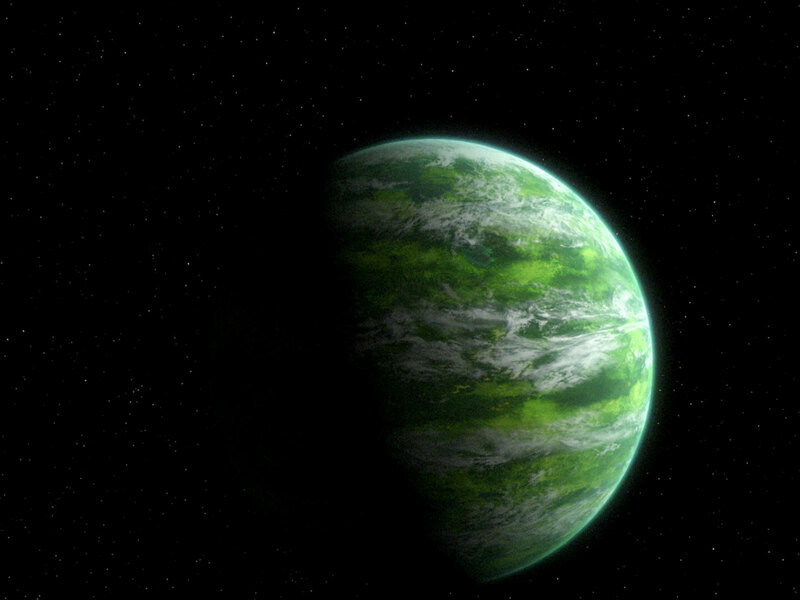 The left half now doesn't move any longer. 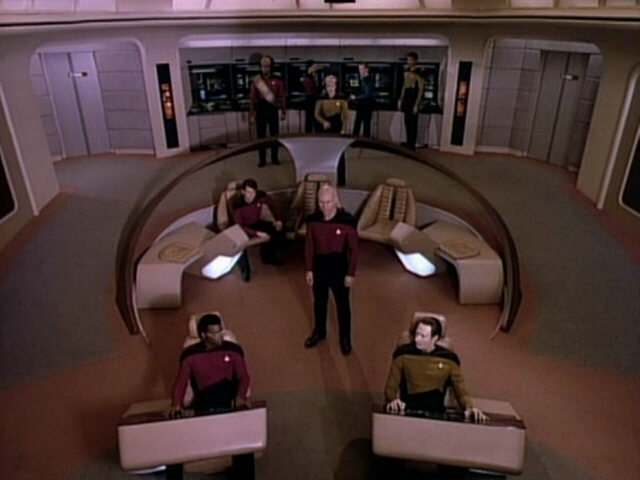 It is all congruent. 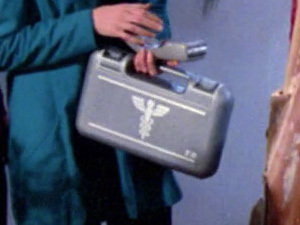 Another medical case/medikit often used by Doctor Crusher makes its first appearance here. 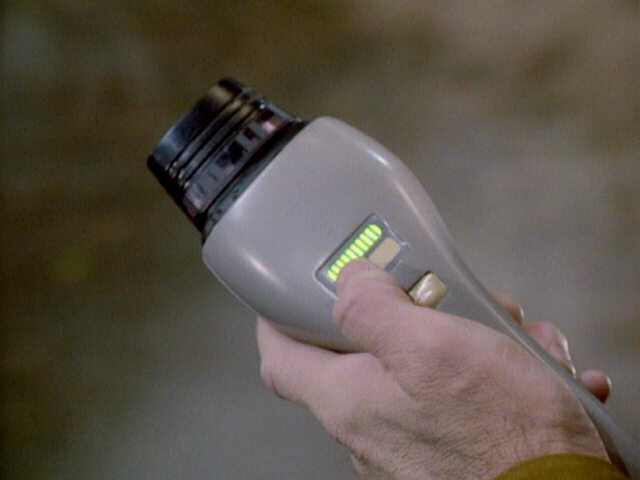 A close-up of the prop in HD. 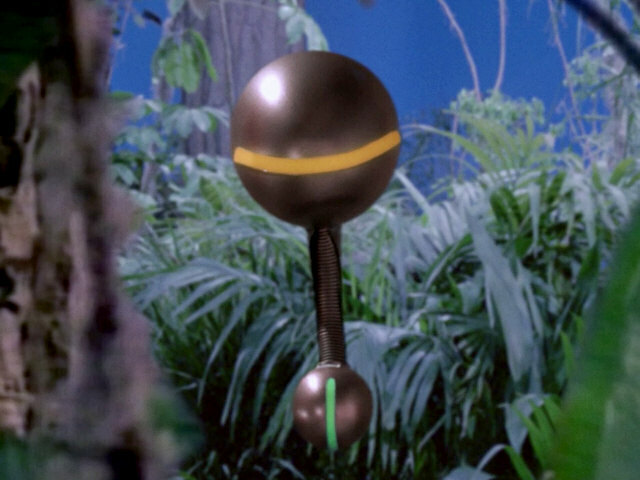 The miniature of the Echo Papa 607 device was famously built using an old L'Eggs pantyhose container and a shampoo bottle. 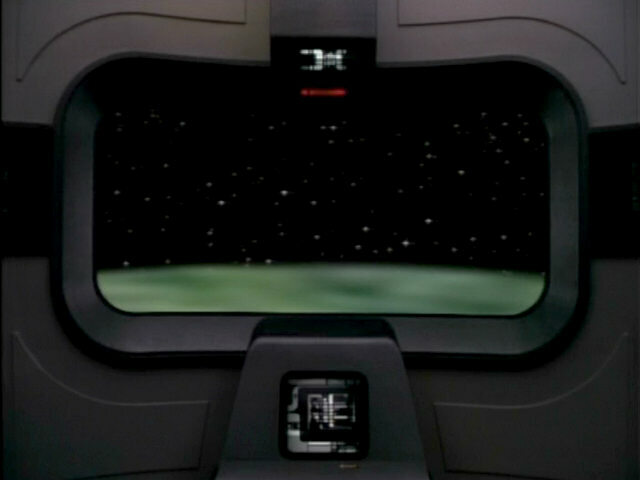 A look at the prop in HD. 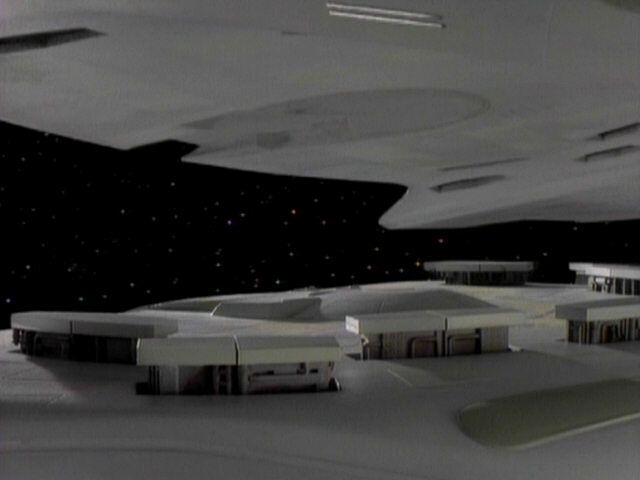 The studio ceiling is visible in this shot. 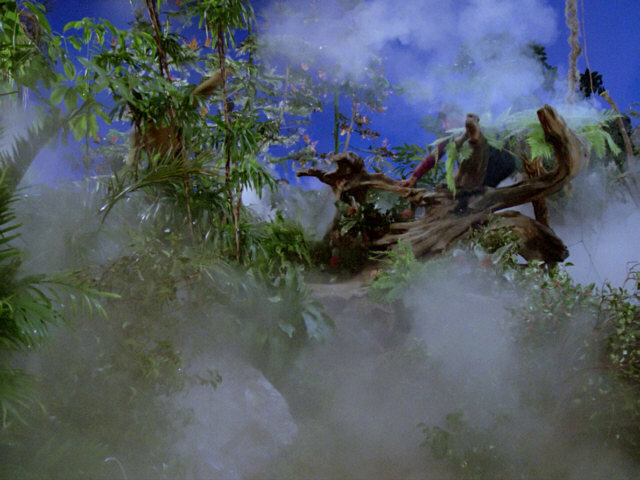 There is no visible studio ceiling any longer. 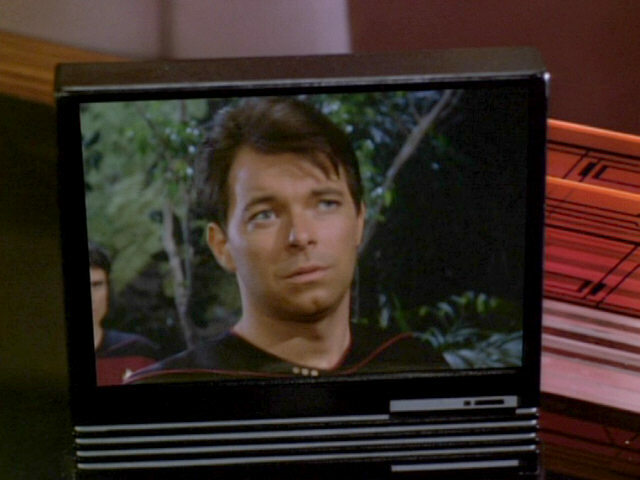 It wasn't retouched, but the scan area was simply smaller and the uppermost portion was cut off. 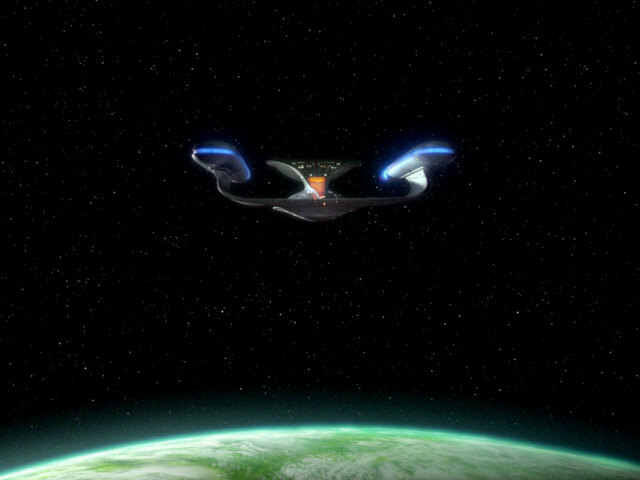 This shot of the Enterprise-D is mirrored. 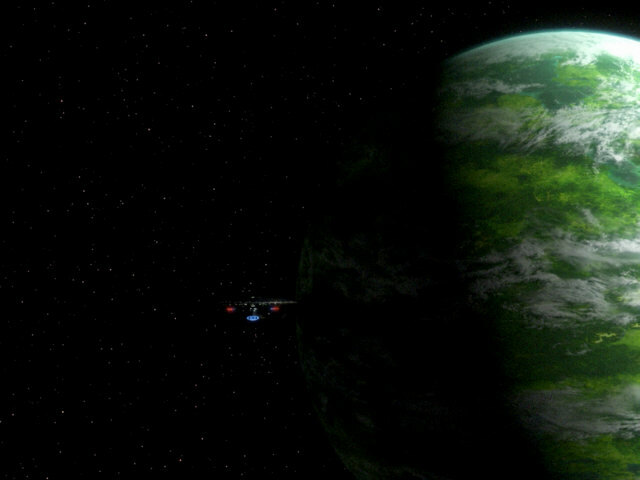 In the remastered episode we can see the mirrored registry whose orientation was not fixed. 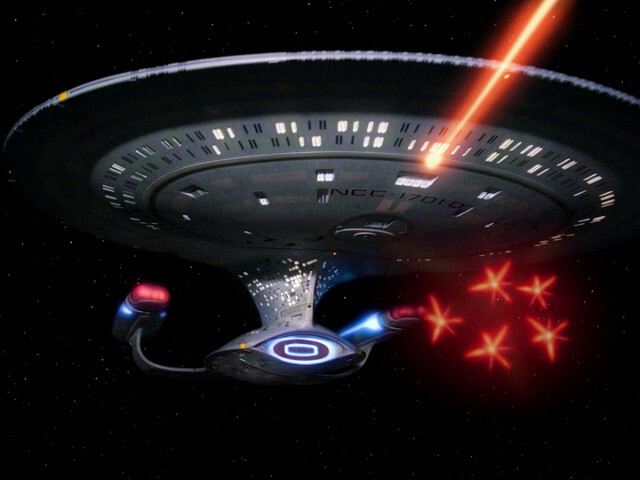 This nice shots shows the Enterprise-D fire photon torpedoes and its phasers at the same time. 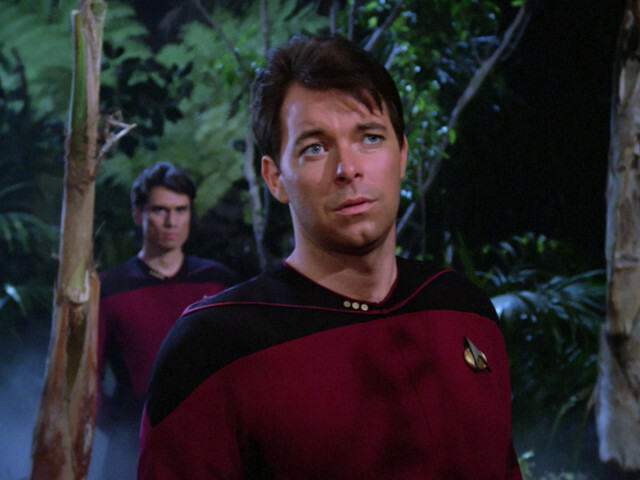 The scene looks a lot sharper in HD. 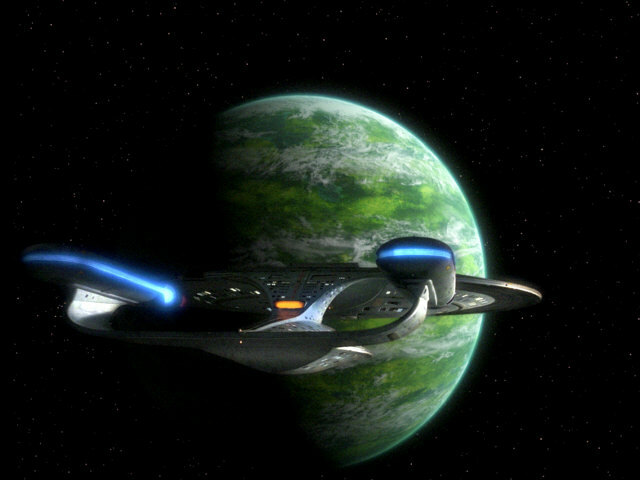 A similar bird's eye view of the bridge was seen in only one more episode, "Skin of Evil" which was the next episode produced after "The Arsenal of Freedom". 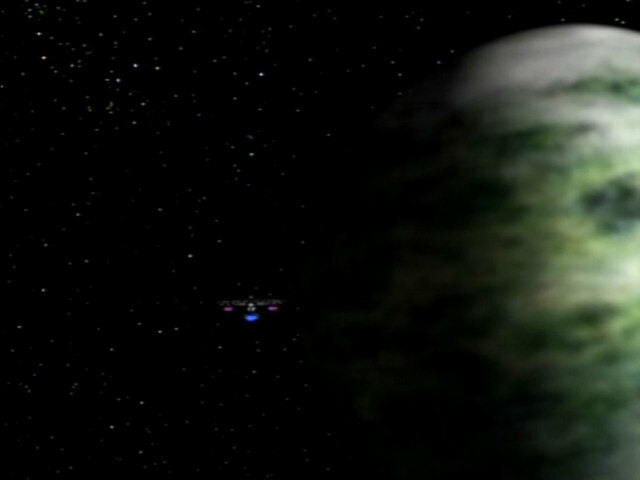 A beautiful shot of the planet Minos, stock footage from "Angel One". 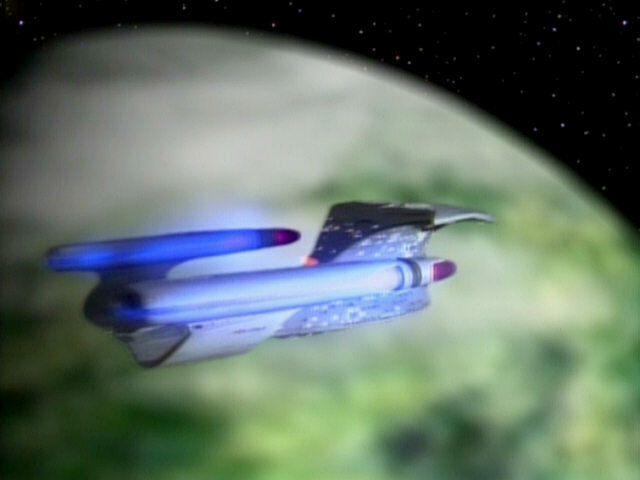 "Angel One" HD As previously mentioned, in the original version of the episode Minos is a re-use of Angel I. 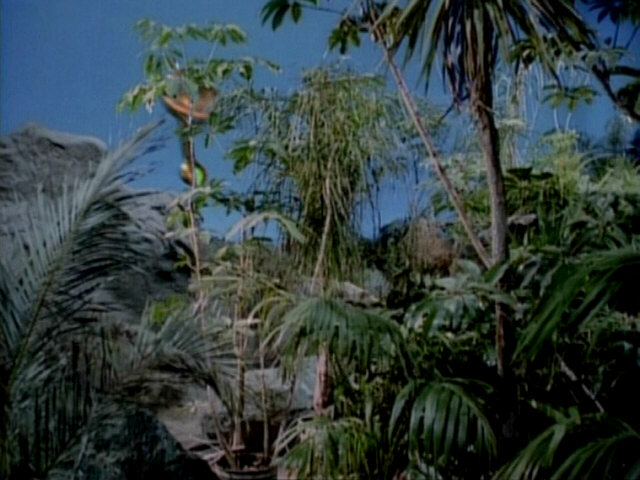 While the new Angel I and Minos, seen in the remastered versions of the episodes, look very similar too, it can be seen in this shot that no stock footage was used, as there are visible differences between the two remastered planets. 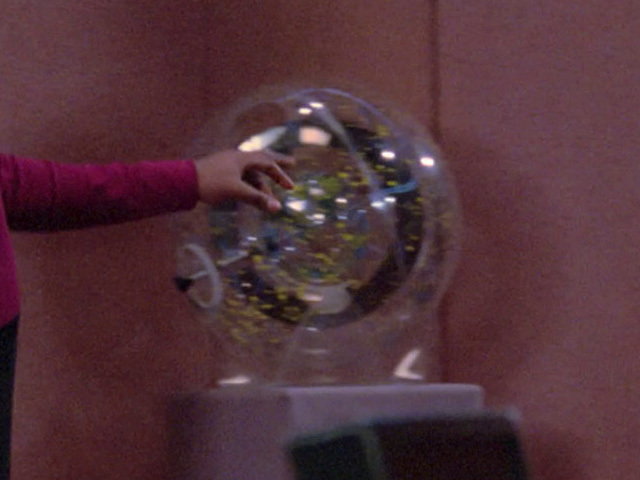 In this scene, the Constellation class model in Picard's ready room is replaced by a transparent celestial sphere. 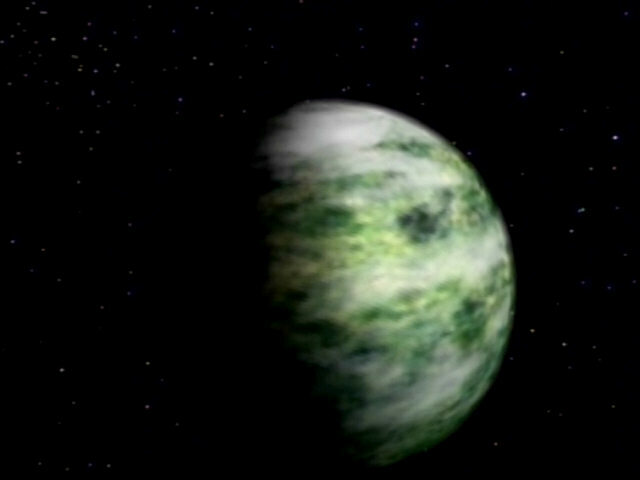 A close-up of the sphere in HD. 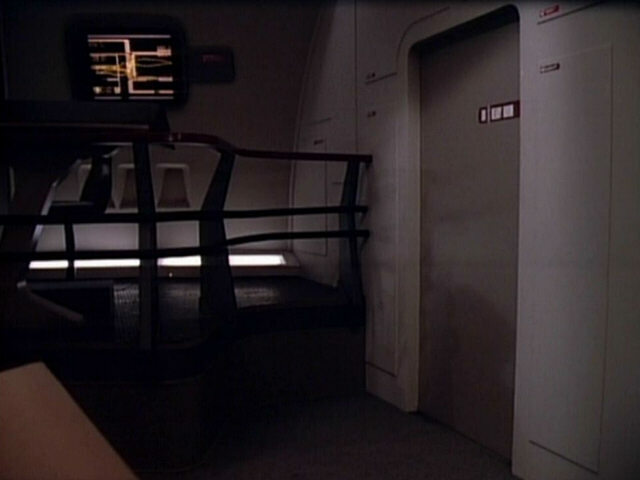 This shot shows the door to the ready room of the battle bridge. 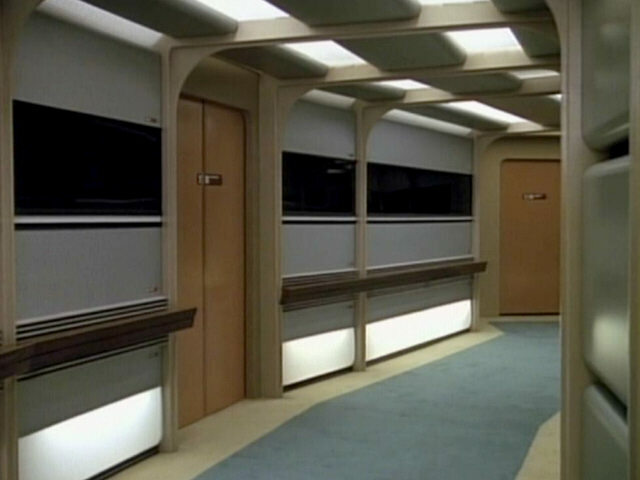 A comparison with a similar shot of the door from "Encounter at Farpoint" reveals that several small red labels were added to the panels on the wall. 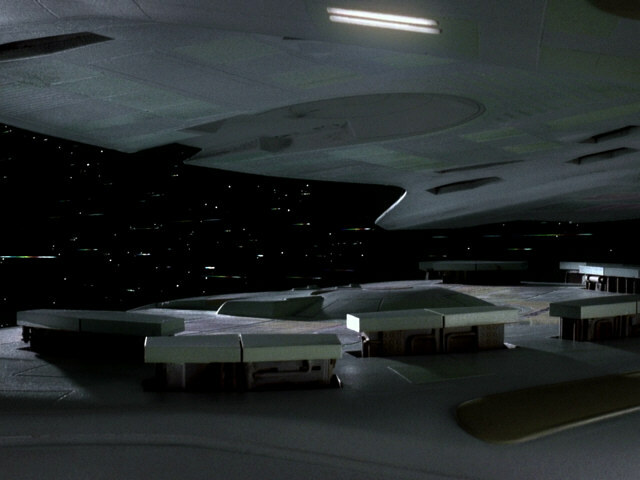 Two more shots from "Encounter at Farpoint" and "The Arsenal of Freedom" reveal how the battle bridge has been faithfully recreated after the set was turned into the 23rd century style bridge of the USS Stargazer. 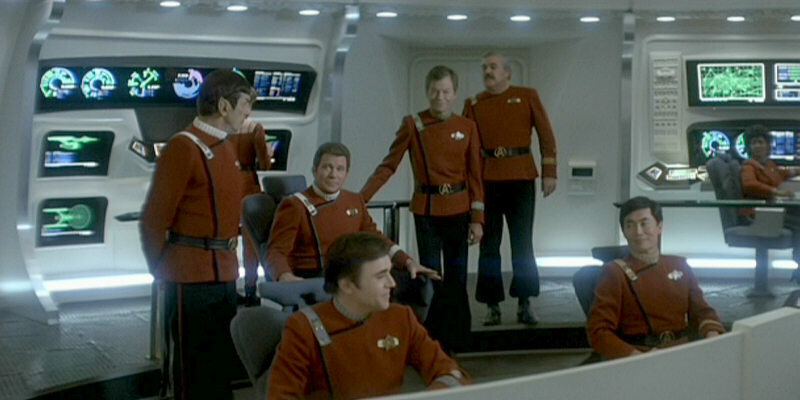 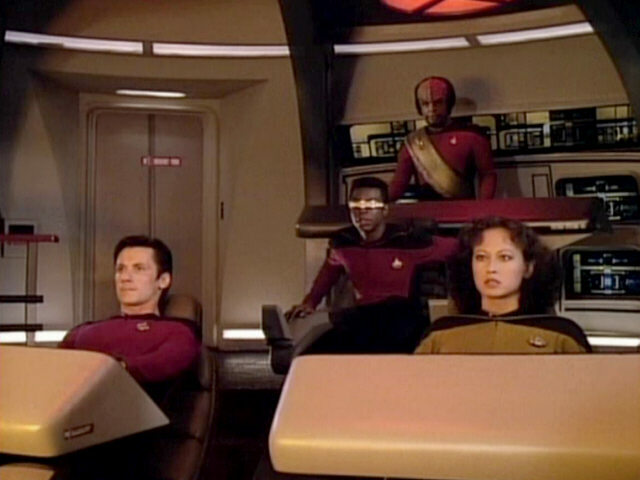 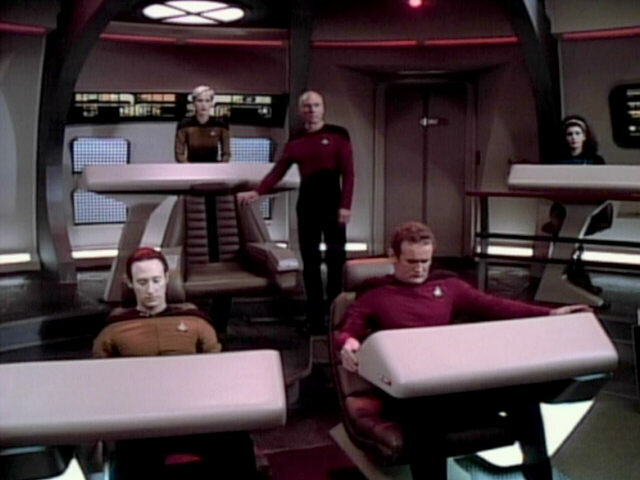 It can be seen that the LCARS displays behind the tactical console have been changed and additional LCARS displays have been placed in the four small screens near the floor behind the tactical console. 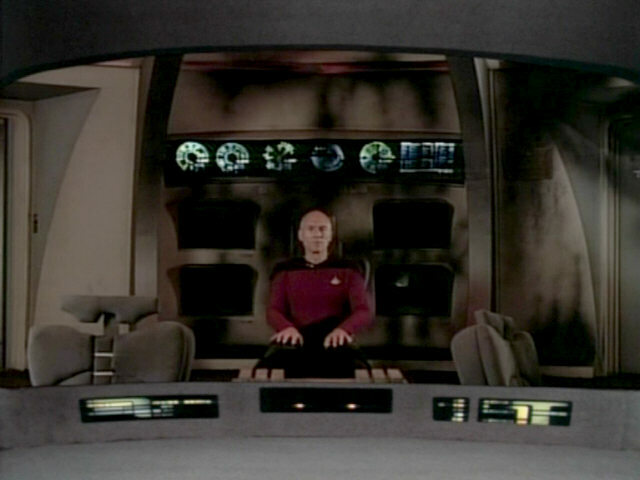 In "Encounter at Farpoint", these screens were covered with a metallic mesh and simply lit with a bright white light. 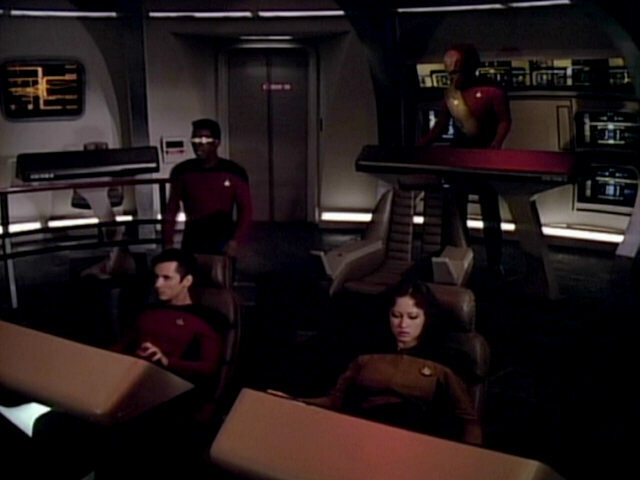 It can also be seen that the consoles have been recolored. 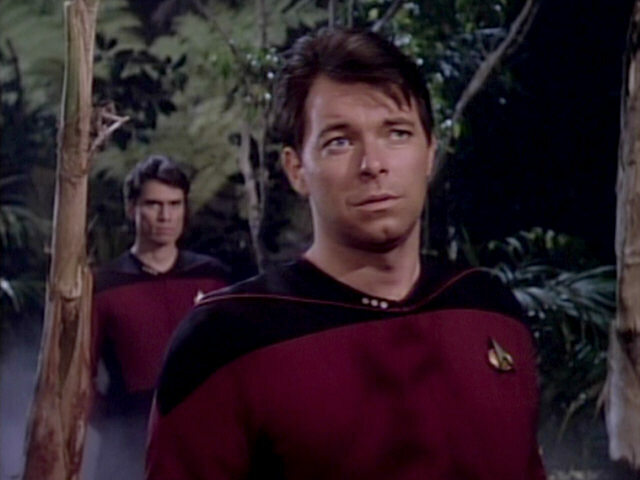 They appear much darker in this episode. 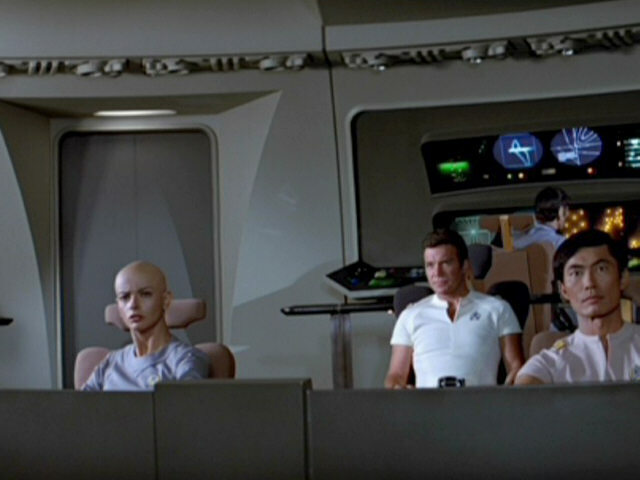 Two more shots illustrated what the set looked like in "Star Trek III: The Search for Spock" and "Star Trek IV: The Voyage Home". 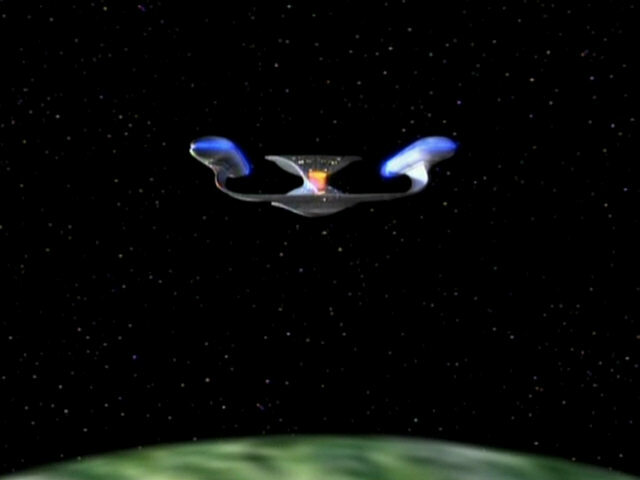 Footage of the saucer separation was re-used from "Encounter at Farpoint". 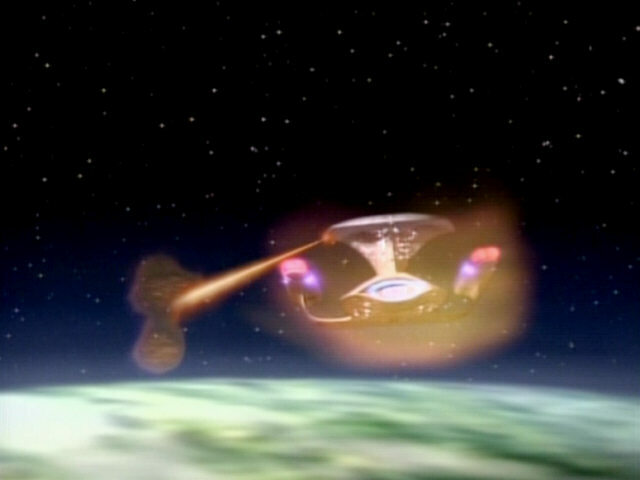 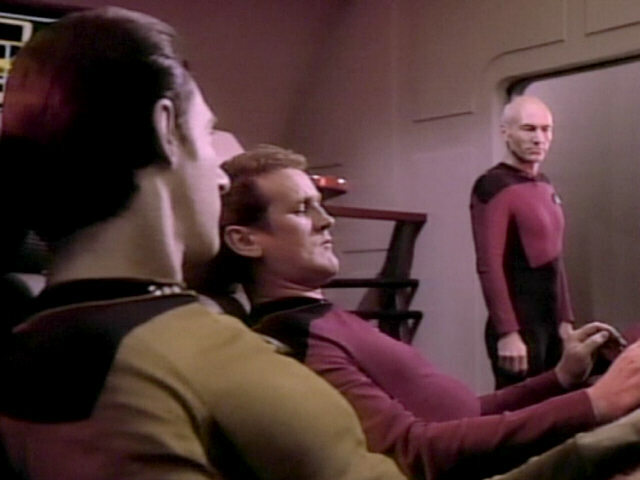 The remastered version accordingly used the same shots as TNG-R: "Encounter at Farpoint". 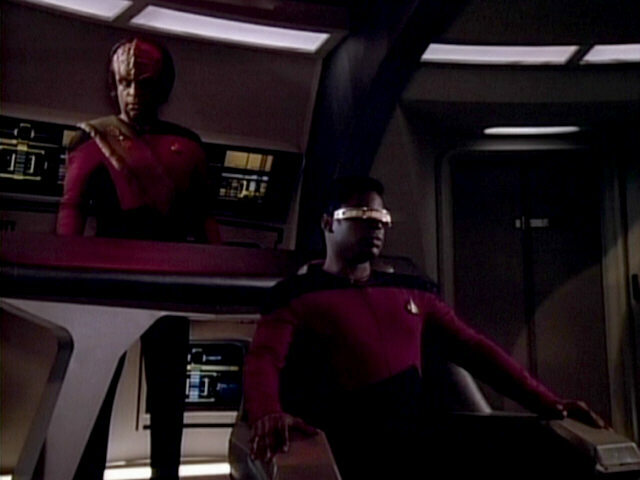 These two shots better show how changes were made to the consoles behind the tactical station. 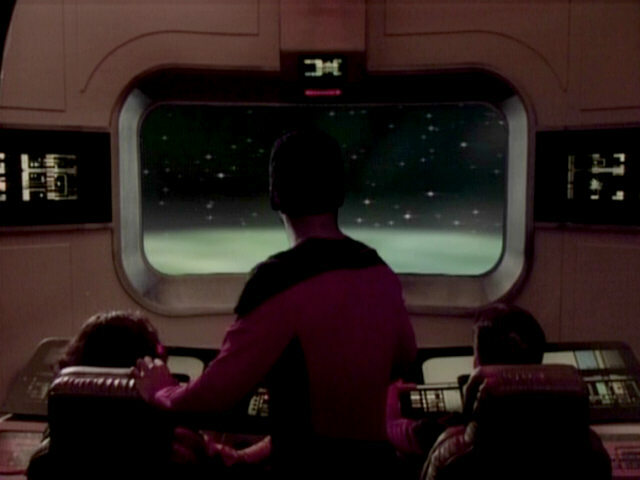 This is new footage of the stardrive section, which did not appear in "Encounter at Farpoint". 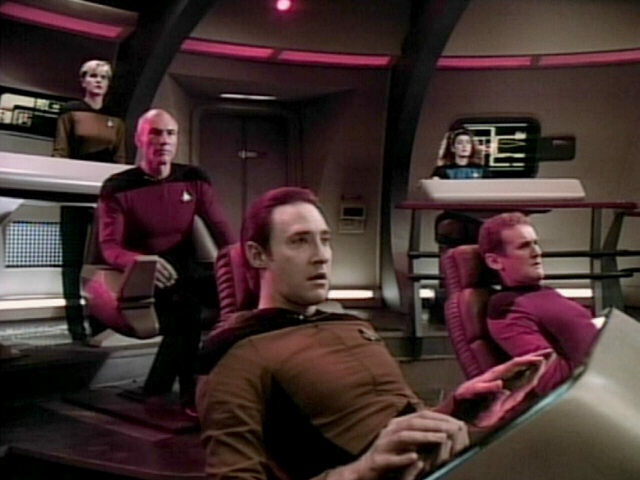 In TNG-R we see the newly scanned footage of the Enterprise with the new planet. 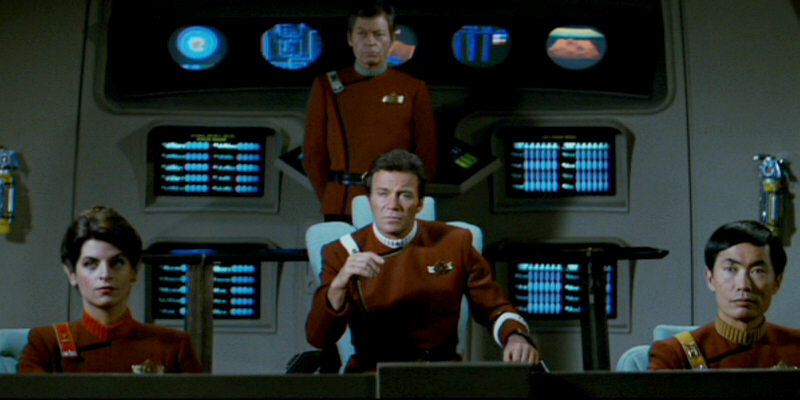 These shots nicely illustrate the differences between the USS Enterprise bridge in "Star Trek II: The Wrath of Khan", the USS Stargazer bridge in "The Battle" and the USS Enterprise-D battle bridge in "The Arsenal of Freedom". 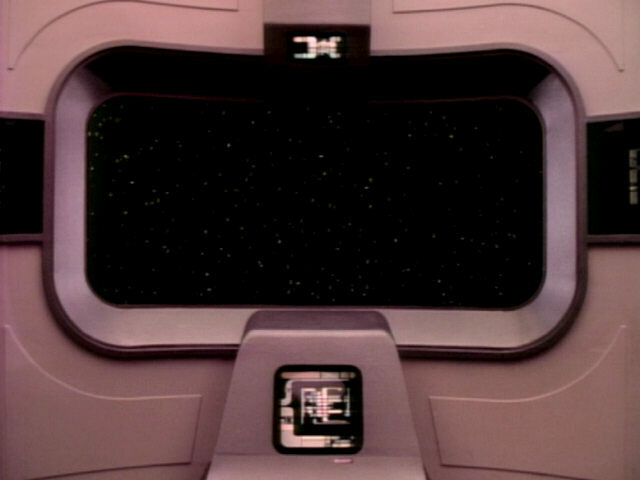 The battle bridge main viewer has not changed at all since "Encounter at Farpoint", only the illumination is darker now. 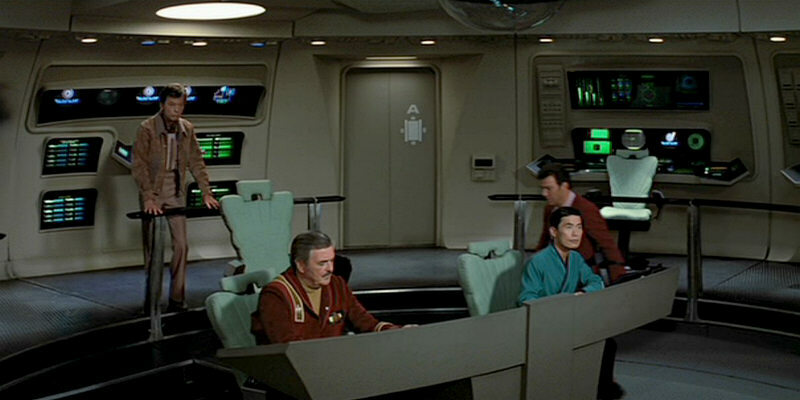 Two shots showing the bridge set from the same angle, one from "Star Trek: The Motion Picture", one from "The Arsenal of Freedom". 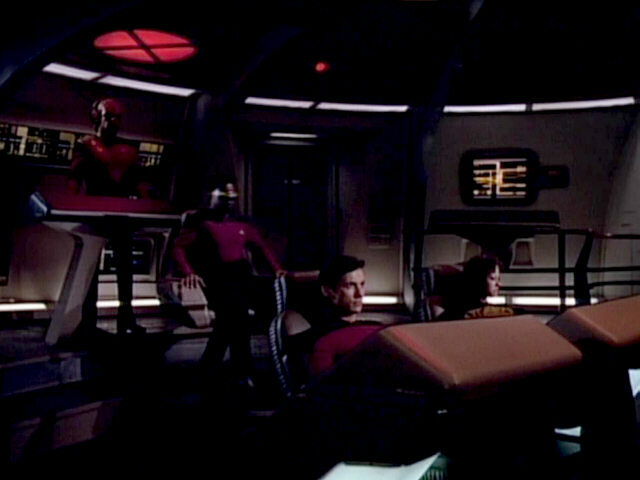 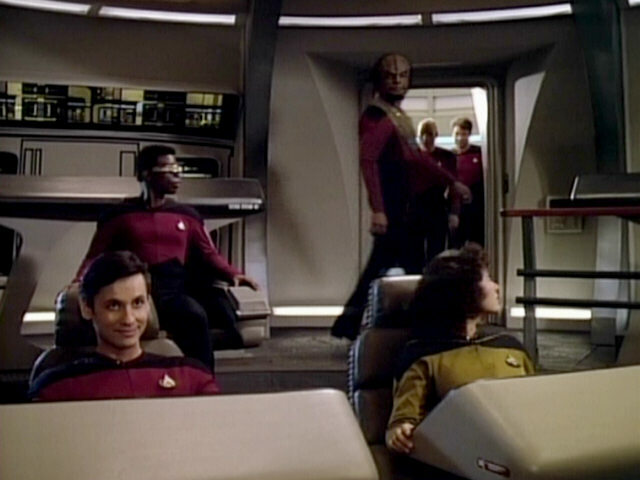 The viewscreen in the left half of the screenshot is the one where Riker watches the briefing about Q in the pilot episode. 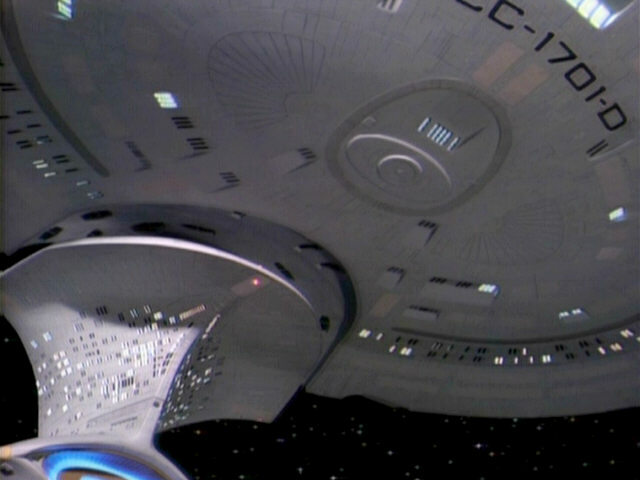 More new footage of the stardrive section. 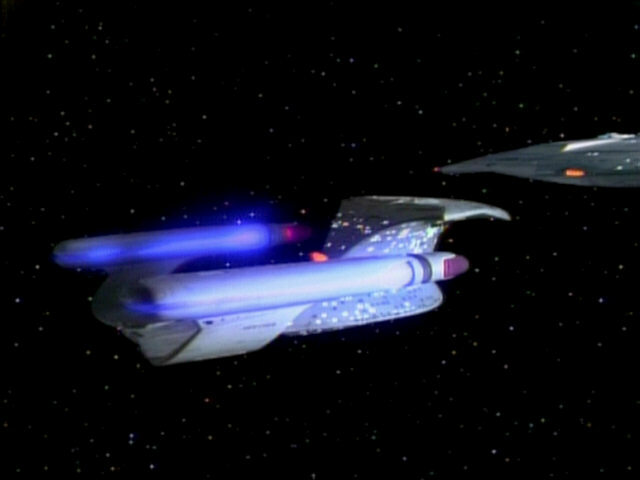 This scene looks better in HD also because the transition of the light effect of the re-entry is smoother, without an unnatural "boundary". 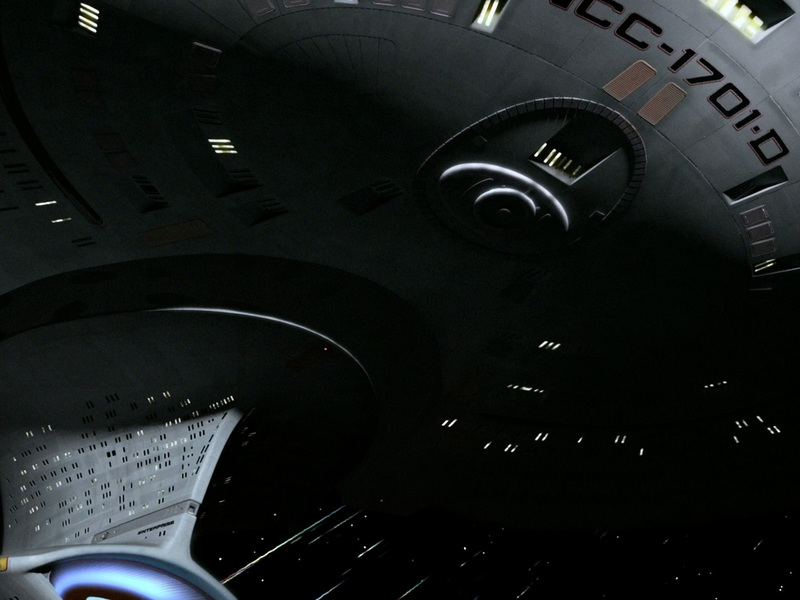 The same camera angle, one shot from the first Star Trek film, one from "The Arsenal of Freedom". 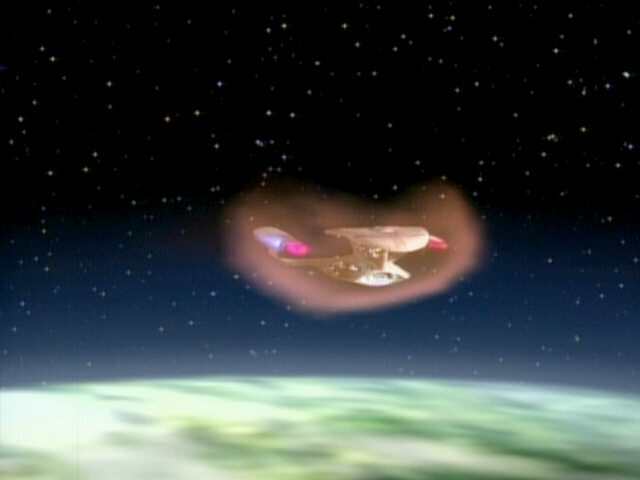 This shot was seen earlier in the episode and also appeared in "Encounter at Farpoint". 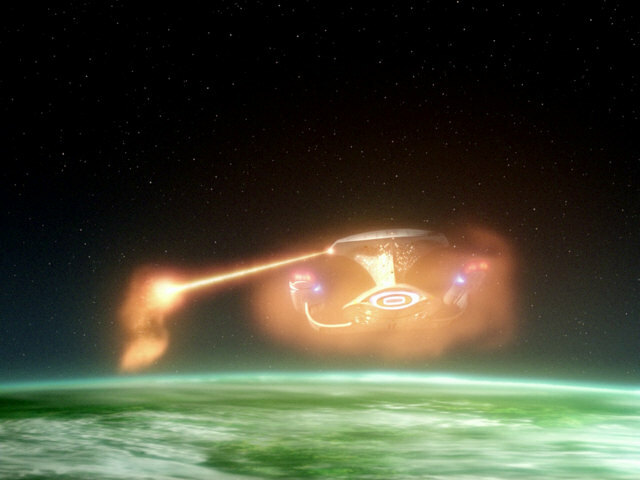 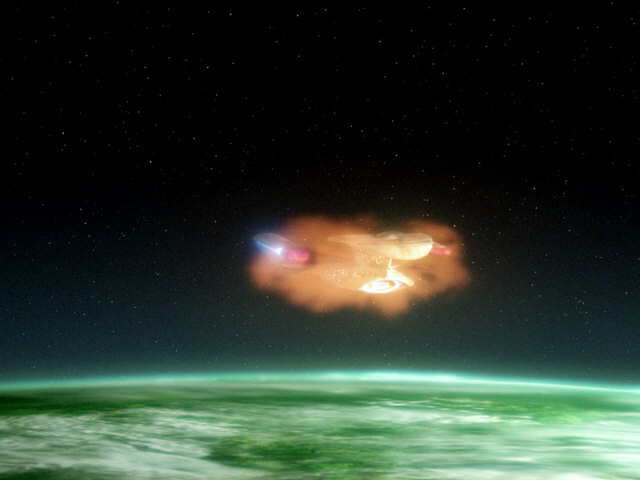 In those two cases, it is part of the saucer separation sequence, though, and thus also features the saucer section. 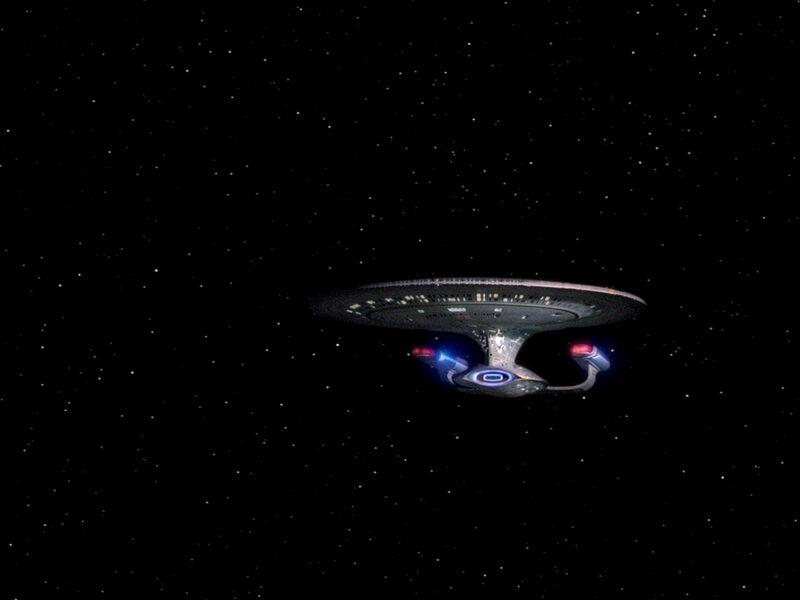 this episode It is still the same shot of the ship in TNG-R, only with greatly improved quality. 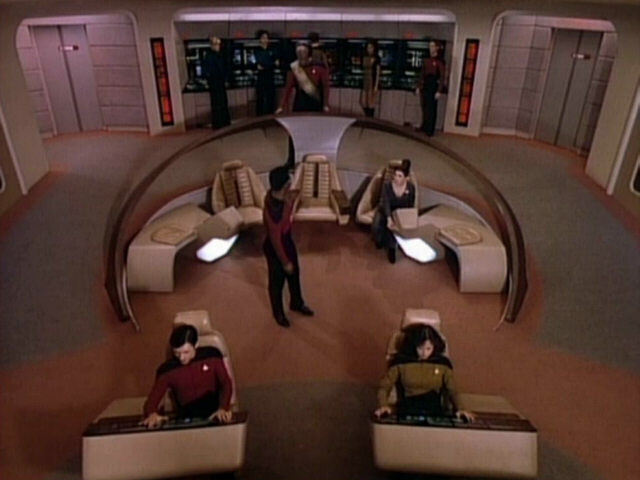 A final comparison between the battle bridge in "Encounter at Farpoint" and "The Arsenal of Freedom".